Today was National Adjunct Walkout Day (NAWD), a first-of-its-kind grassroots action in which some adjuncts at colleges and universities across the country walked out of their classroom in protest of their—our—unfair pay and working conditions as second-tier faculty. At CUNY, no adjuncts walked out due to New York State’s 1967 Taylor Law, which prohibits public employees from striking (though at a Professional Staff Congress Graduate Center chapter meeting over lunch today, Stanley Aronowitz made an impassioned plea to break the Taylor Law in order to break the our contract-bargaining impasse with the state, which hasn’t okayed an economic offer yet). 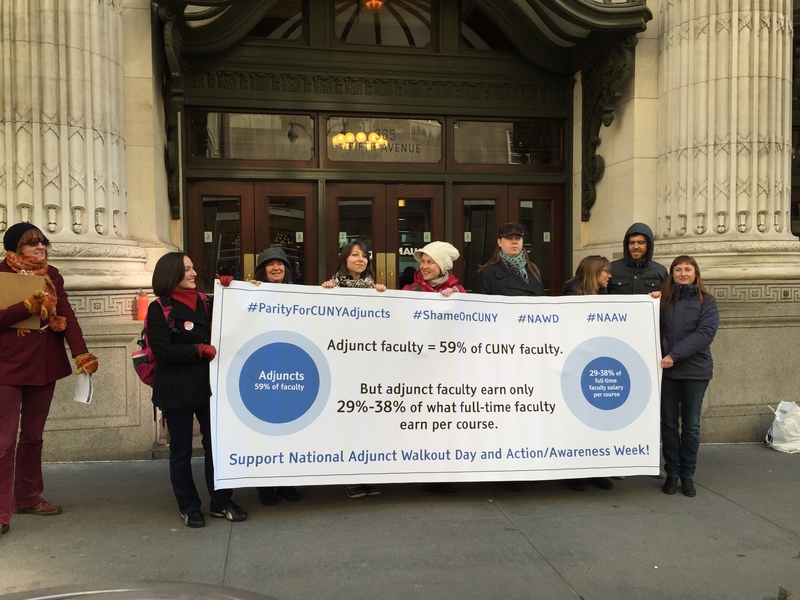 Instead, adjuncts, graduate employees, and other faculty taught about academic labor and adjunctification in their classes (resources to do so, anytime, via the CUNY Adjunct Project), tabled in common spaces on their campuses, and held meetings, departmental and otherwise, to discuss the significance of NAWD and the adjunct struggle broadly. 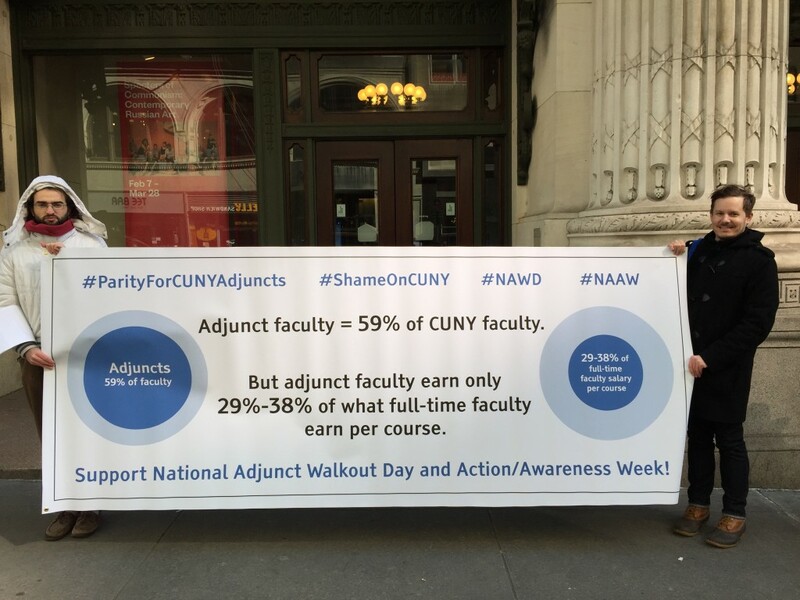 At the Graduate Center, the CUNY Adjunct Project collaborated with GC students to make and hold a banner in front of the GC’s entrance pointing out that, while adjuncts make up 59% of CUNY’s total faculty, they’re only paid 29%-38% of what full-time faculty are paid. In addition to the banner, we created a flyer (see it below) that provided more data and analysis, and which explained the Taylor Law and its effects, to hand out to both GC students, faculty, and visitors as well as passersby on the busy block on which the GC is located, just north of the Empire State Building. A few PSC organizers also joined us and handed out an additional flyer that amplified the message of the day. We held the banner and flyered from 11:30 a.m. to 12:30 p.m., at which point we went upstairs to the aforementioned chapter lunch meeting (an important opportunity to share news and discuss various labor matters). No doubt we would’ve reached more people if we’d stayed longer, especially given the uptick in people traffic as the lunch rush continued, but we gave out 400+ flyers in the hour we were there, a decent result. 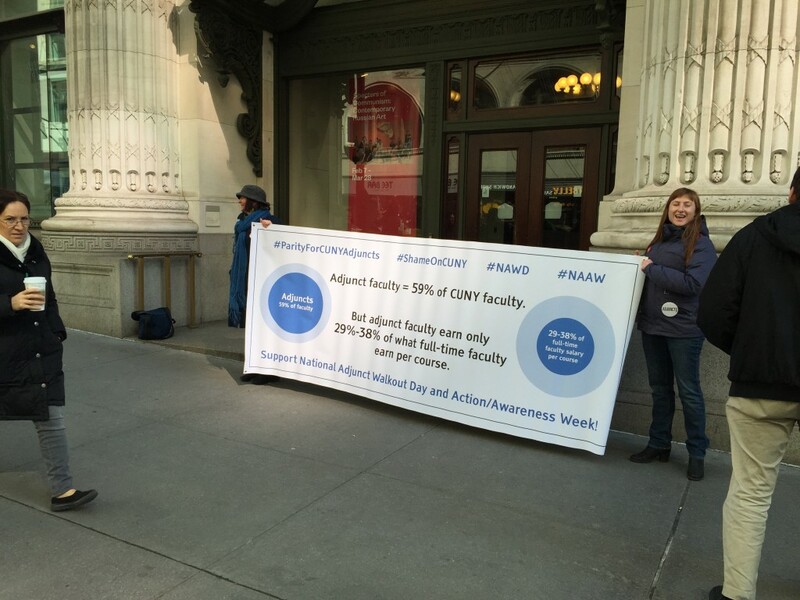 And the banner’s being used again for an action at CUNY’s Hostos Community College on Friday, as part of National Adjunct Action/Awareness Week, the longer-duration event NAWD gave rise to. People already have been asking us what’s next. Let us know what you’d like to see happen, and if you’d like to be involved in making it happen, in the comments to this post. Below is the flyer we handed out, as well as a short video of the action and additional photos. If you’d like to amplify the action, use the hashtags listed in the flyer and post to Facebook, Twitter, or other social media. This is the 9-6 Rule as stated in the Adjunct Rights and Benefits brochure under the heading Workload. The rule is articulated as well in longer form in article 15.2 of the 2007-2010 contract between CUNY and the PSC. The purpose of this petition is to bring about the elimination of the 9-6 rule, or more specifically to induce the leadership of the PSC to exclude it from the agreement they are in the process of making with the City University of New York. The rationale given by the PSC for the 9-6 rule is that it counteracts exploitation. We will show how the arguments given in support of this rationale are insupportable. One of the arguments in support of the 9-6 rule is that adjunct faculty are being exploited, that no one should work full time for part-time wages and that adjuncts are entitled to greater parity with full timers. This is a valid assertion, but the fact remains that the 9-6 rule has done nothing to increase the pay of part timers. Rather than promoting parity, the 9-6 rule has only succeeded in diminishing it by limiting employment opportunities for those who are in the greatest need of them. To make matters worse, starting next fall certain 3 credit courses at certain campuses will become 4 credit courses. This means that anyone teaching a 4 credit course will be able to teach a maximum of two courses – either two 4 credit courses or one 4 credit course and one 3 credit course at one campus. The resulting loss of hours and pay for those who are accustomed to teaching three courses at one campus will be significant and unavoidable unless the 9-6 rule is abolished. It is further argued that CUNY’s intention is to save money by hiring as many part-timers as possible. Hire more, pay less. Rather than limiting the number of adjunct faculty, the 9-6 rule has only compelled the schools to hire more of them. When new courses open up just prior to the beginning of the semester, new adjuncts are hired because the ones already under the schools’ employ are already working the maximum number of hours set by the 9-6 rule. It has also been argued that compelling adjuncts to seek employment at a second school is beneficial since it provides backup in the event that cancellations occur at the other. This argument is insupportable for two reasons. Firstly, balancing jobs at two or more campuses is a hardship involving extra travel time and cost as well as the inconvenience of dealing with conflicts involved in scheduling classes. Secondly, the elimination of the 9-6 rule would in no way prevent part-timers from seeking employment at more than one campus if they want. On the contrary, they would be able to teach more courses at different campuses than they are currently allowed to and as such would be in an even better position to deal with the advent of cancellations. It is now time for the PSC leadership to acknowledge that the 9-6 rule undermines the wellbeing of the very people it is intended to protect. It is with this consideration in mind that we invite our fellow union members to sign and circulate this petition calling upon our representatives in the PSC to propose, in their current negotiations with CUNY management, that the 9-6 rule be eliminated, and/or that the Executive Council of the PSC grant a general waiver in perpetuity allowing adjuncts to teach over and above the current hours limitations. To sign this call, leave a comment (click on “comments,” then scroll all the way down) with your name and CUNY affiliation(s). Thanks! It has now been 78 days since union president Barbara Bowen and 17 other union and Graduate Center (GC) chapter leaders have received the open letter, with no response from Bowen. We’re currently at 186 signatories. In significant news, however, there’s now progress on one of the asks in the letter: the change in chapter-affiliation policy for graduate student workers. Adjunct Project (AP) coordinators Jenn Chancellor, Luke Elliott, and I met with the union’s executive director, Debbie Bell, first vice-president, Steve London, and treasurer, Mike Fabricant, on Monday, June 30th, at the union’s office near Wall St. to discuss the AP’s proposal. Whether this meeting occurred in part because of the letter campaign is hard to say—as the letter itself mentions, the AP submitted our proposal way back in December—but we tend to think the campaign had something to do with finally making the meeting happen. We met again today with Bell and Fabricant, along with GC chapter chair Michael Handis, officer Penny Lewis, and a few Doctoral Students’ Council officers, to firm up the details as we head toward the beginning of the fall semester. The union’s current policy on graduate-student-worker affiliation is that the campus on which you provide instructional labor determines what chapter you affiliate with, regardless of whether you’re paid by the GC (via a graduate fellowship) or by that particular campus (as an adjunct). Our proposal was to allow all graduate student workers at the GC, regardless of the campus on which they provide instructional labor or the source of their wages, to affiliate with the chapter of their choice: either the GC or the campus on which they provide instructional labor, whether as an adjunct or as a fellow. The basic rationale was that our student status and our instructional-labor status as GC students cannot be separated given the large inequities in fellowship funding at the GC—and, thus, that if one is adjuncting at a CUNY campus, as opposed to being an instructional fellow there, the need to adjunct is directly determined by the inequitable distribution of resources by the GC (and CUNY). The union’s counter proposal, in turn, met us halfway: union leadership has agreed to give all GC students on fellowships the choice of which campus to affiliate with, the GC or the one at which they provide instructional labor, but they will not budge on giving adjuncting GC students the same choice. We spent more than an hour discussing their reasons for this decision and offering our counter reasons, but they were adamant, mostly for reasons of litigation concern (owing to litigation they were entangled with several years ago after an insurgent, albeit right-wing, party contested the executive-slate election and lost) and impressions of unfairness, since graduate student workers at other campuses would not also be able to have a choice in chapter affiliation. We agreed to go forward with their proposal, to which they added the offer of forming a standing committee of the union’s executive council dedicated to graduate-student-worker issues and composed of graduate student workers from across CUNY. Altogether, we’ll be able to build graduate-student-worker power in close proximity to the union’s leadership body at the same time we build it at the GC under the new chapter-affiliation policy. Bell, London, and Fabricant suggested both the policy change and the standing-committee proposal could go before the union’s Delegate Assembly (the legislative body) for approval at its late-September meeting, and Bell and Fabricant confirmed that timeline again at today’s meeting. We’re glad to be working with them on this initiative, though we remain committed to the two remaining asks in the open letter (the union having not provided free registration to CUNY adjuncts for next week’s COCAL XI conference. Instead, please join us at #altCOCAL next Wednesday from 1:30p). COCAL XI, the eleventh conference of the Coalition of Contingent Academic Labor, takes place Monday, August 4, through Wednesday, August 6, at John Jay College/CUNY. 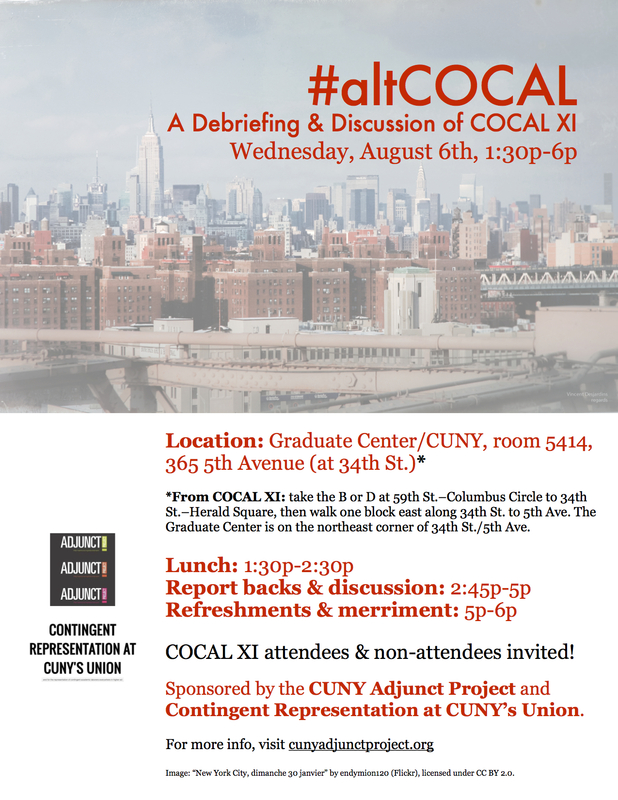 We invite all those attending COCAL XI—and all those who are not—to join us for lunch and discussion on Wednesday, August 6, to consider ways forward, both for the conference and for the movement to end the two-tier system of academic labor. Sponsored by the CUNY Adjunct Project and Contingent Representation at CUNY’s Union. *From COCAL XI, take the B/D at 59th St.–Columbus Circle to 34th St.–Herald Square, then walk one block east along 34th St. to 5th Ave. The Graduate Center is on the northeast corner. 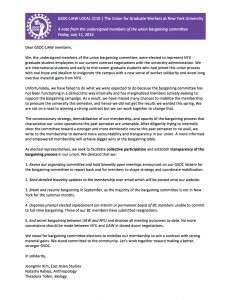 The following statement was released today by three members of the NYU Graduate Student Organizing Committee local of UAW, calling for accountability, transparency, and representation in their union’s contract bargaining with NYU. We’re inspired by their example and stand in solidarity with them. All unions must function democratically, not just pay lip service to such. 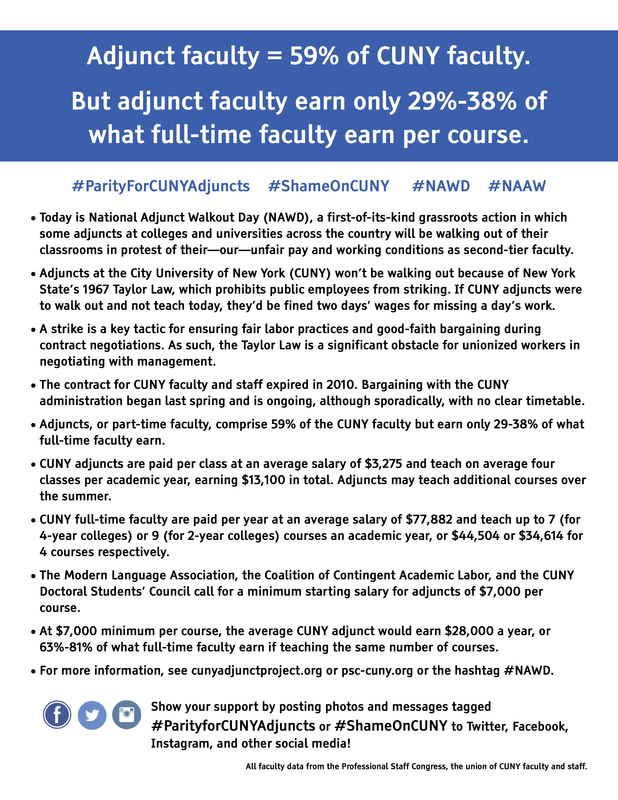 Earlier this week the open letter to the CUNY union leadership was posted to the AAUP’s Academe blog, which spurred two additional posts (here and here) as well as many comments (and I encourage you to read them all, as they helpfully illuminate the deep fissures between full-timer-dominated unions and academic associations on the one hand and contingent academic laborers on the other). Unfortunately, though predictably, a slavery comparison cropped up in one of the comments in relation to the open letter, and as the author of the open letter, I wanted to make clear that I disagree with any such comparison. I posted the following comment to the Academe blog post that contains the comment in question. I thank everyone for their support of the open letter and the related campaign for the representation of contingent academic laborers in full-timer-dominated unions—a national effort as the comments show. I want to comment on the “slave-labor conditions” comparison in the second comment above. I’ve critiqued such comparisons on Twitter—and many more knowledgeable folks than I have written powerful critiques of it (for one particularly good example, see here)—but because this comparison is now cropping up in relation to the open letter, I need to say that I disagree with any and all comparisons between contingent academic labor and racialized social and economic control of any kind, whether slavery, segregation, apartheid, or any other form. Such comparisons, unfortunately, are a consistent trend in rhetoric on contingent academic labor. I disagree with such comparisons both because, to me, they’re inaccurate—contingent academic laborers aren’t chattel, or property, or legally separated or denied civil equality, or racialized in any way qua their contingent labor—and because such comparisons are highly offensive to many people who are racialized, especially African-Americans who still deal with the multifarious legacies of slavery and Jim Crow today. Such comparisons are also offensive to many people who aren’t racialized by dint of their white privilege, including me. Furthermore, the abolition of slavery was a highly complicated process that can’t be reduced to a metaphor (much like slavery/apartheid/segregation can’t): it had as much to do with U.S. westward expansion, for instance, and the question of whether new territories should allow slavery, as anything else—which is to say that the abolition of slavery was predicated in part on the further dispossession and genocide of indigenous communities. That dreadful connection comes with any reference to the abolition of slavery—and, again, we deal with the legacies of both slavery and indigenous dispossession and genocide today. Finally, these comparisons to racialized social and economic control betray the fact that both the students and faculty of higher education remain largely white, and that higher education actually works as a form of racialized social and economic control, as does public education at all levels given the gross inequities of educational resources, on top of the gross inequities of economic and social resources at large. Indeed, because racial discrimination, in both overt and covert ways, remains a potent force in U.S. society, racialized students and faculty, including contingents, experience greater challenges, inside and outside academia, than their white counterparts. And though higher education staff tend to be appreciably more racially diverse than students or faculty (for a variety of reasons), that doesn’t diminish the challenges racialized staff members face. All of these aforementioned issues are apparent to me in my academic research and, especially, in my teaching and organizing at CUNY, a highly stratified public university that not only reflects its highly stratified city but contributes to the city’s stratification, as I note in the open letter. Just wanted to make my thoughts known since I’m responsible for the open letter, even as it continues to take on a life of its own. 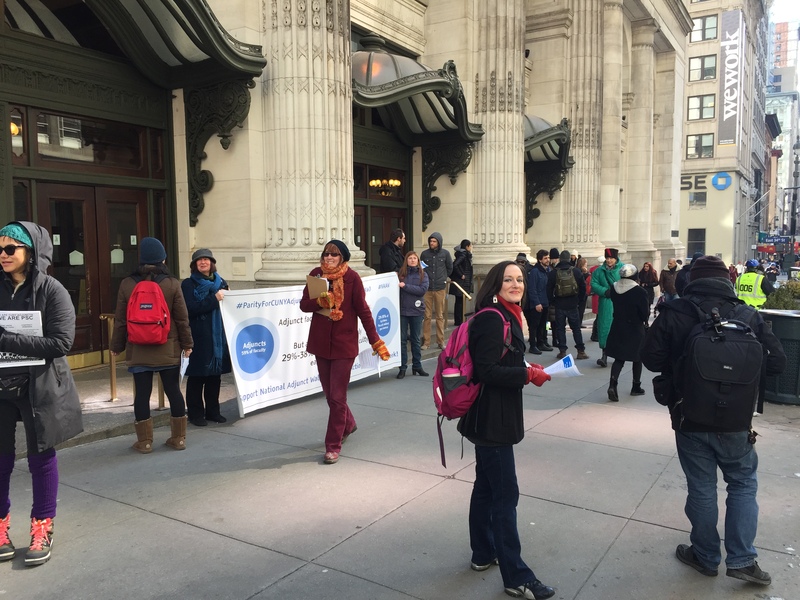 “The contract the PSC settled with CUNY in June 2006 left the abysmal conditions of contingent faculty in place. An adjunct activist who is a CUNY Internationalist Clubs member spoke at the union’s Delegate Assembly calling for a ‘no’ vote on the contract. However, while many ‘part-timers’ were deeply dissatisfied, by and large they tended to buy the promises of the union leadership (organized in the social-democratic ‘New Caucus’ of union president Barbara Bowen) that ‘adjunct issues’ would be a priority in future rounds. 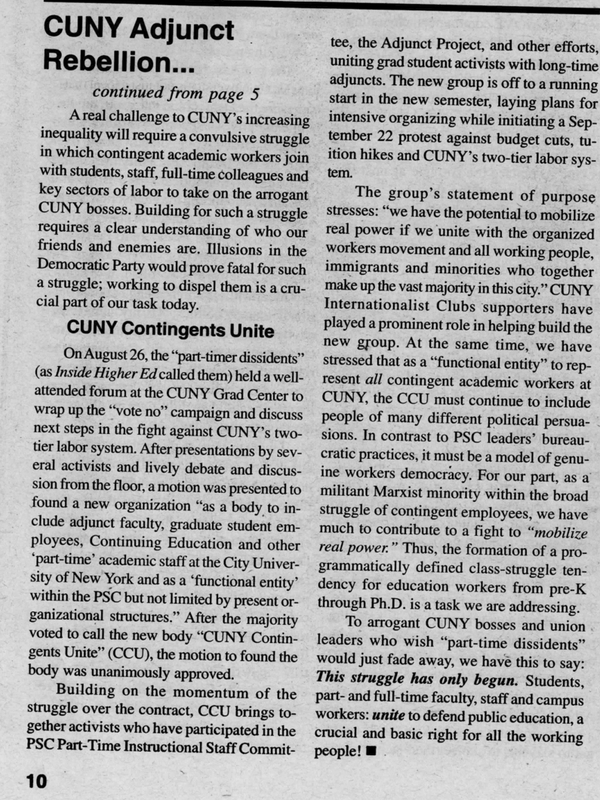 Some also wanted to avoid criticizing the union officers at a time when the New Caucus was running for reelection, facing a right-wing opposition called CUNY Alliance. 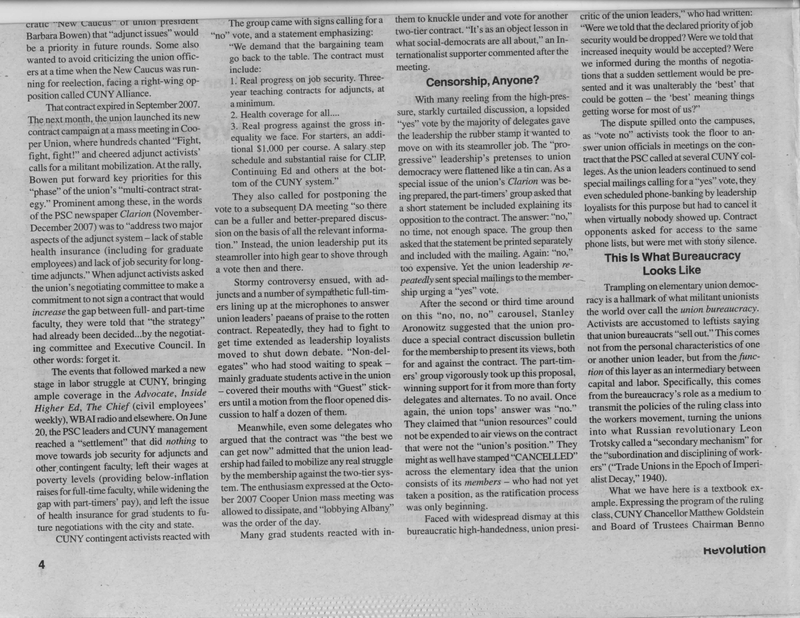 “On June 20, the PSC leaders and CUNY management reached a ‘settlement’ that did nothing to move towards job security for adjuncts and other contingent faculty, left their wages at poverty levels (providing below-inflation raises for full-time faculty, while widening the gap with part-timers’ pay), and left the issue of health insurance for grad students to future negotiations with the city and state. 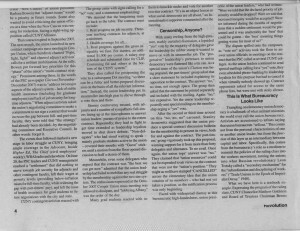 Click the images below to read the whole article from the September 2008 issue of Revolution. 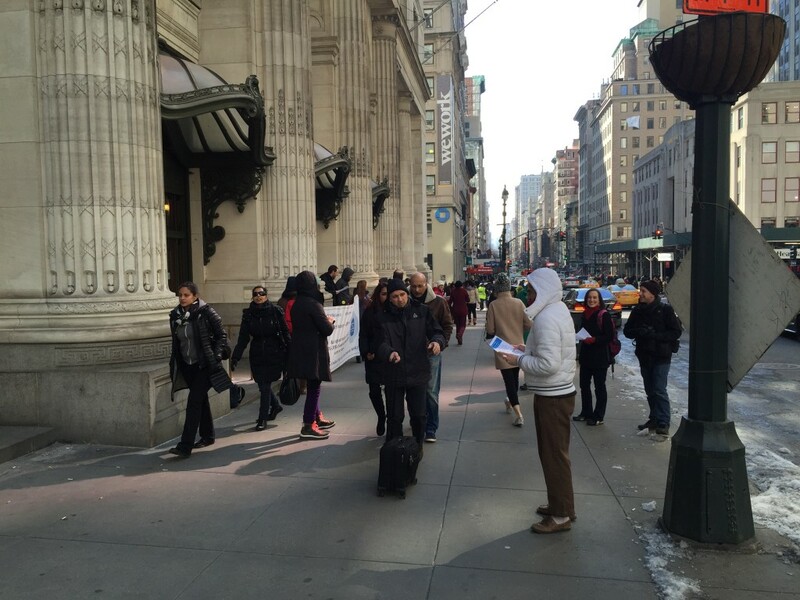 Day 16–No Response from CUNY Union Pres. Tuesday, May 13th, at 3:40 p.m. I sent an open letter to Barbara Bowen, president of the Professional Staff Congress, CUNY’s union, with the subject line “Open letter re your De Blasio statement & your exclusion of adjuncts and graduate student workers.” I copied the union’s first vice-president, treasurer, vice-president for part-time personnel, and executive director on the email, all people we Adjunct Project coordinators have worked with, or attempted to work with, this academic year. I also copied 11 of the 12 members of the newly reconstituted (and elected) Graduate Center chapter slate, omitting one member because I couldn’t find an email for that person. Finally, I copied two higher education officers (HEOs) at the Graduate Center, one of whom is a cross-campus officer on the executive council of the union, both of whom, working together, put together the Graduate Center slate (with no input solicited from the Adjunct Project). Additionally, another member of the Graduate Center chapter slate, Michelle Chen, who was not among the original recipients of the letter because I couldn’t find her email address, has signed the letter. I am now sending the letter again to the aforementioned recipients, plus Chen (as I now have her email address), along with the names and affiliations of the 176 signers. The union leaders and chapter leaders are supposed to represent us. It’s not the other way around. Read and sign the letter here, or leave a comment here with your name and affiliation (if you have one—it’s not necessary). There are now 176 of us, from across CUNY and the U.S., inside and outside of higher ed. Every day the union leadership doesn’t respond to us only emphasizes our lack of representation. In response to Keith Hoeller’s recent post, I might pose an alternate perspective to the position that FT and PT faculty have irreconcilable differences and an all-faculty solidarity is impossible. First, though, let me say that I am an adjunct also in Washington State; I understand that faculty unions here have never squarely confronted the problem of a divided faculty and in particular the exploitation of adjuncts, our union’s weakest links. The case that Jack Longmate mentions where a measure of job security for adjuncts was signed away by an all-FTer bargaining team is certainly disappointing and a cautionary tale, but the truth is that it must have been a mostly FT union bargaining team that won that job security in the first place. It is inaccurate to say that AFT/NEA have done nothing for adjuncts in WA, especially considering that we are the only state in the nation to have won the right to unemployment for adjuncts in all breaks via union political action (see details here). There are historical and contemporary reasons to be frustrated that public faculty unions are not doing all they can, but we should understand that taking a categorical and polemical stand against united faculty unions is at best, one side of the story. If anyone knows of the Vancouver Model of Vancouver Community College in British Columbia, adjuncts there in the ’80s built coalition with egalitarian FTers, overcame reactionaries, took over the union, and now virtually 100% of faculty are FTers and everyone is on the same pay scale. The only problem with Keith’s thesis is that what the coalition that VCC adjuncts and egalitarian FTers built has never seriously been tried in Washington State. By this I mean not a gadfly phenomenon, but systematically organizing adjuncts to take power in our union and building a coalition with those egalitarian FTers. This means using time-tested union organizing techniques like systematic faculty to faculty communication and organizing conversation. In fact, we are working on just such an alliance at my community college in preparation for our 2015 contract. Perhaps we will succeed in building a united and progressive coalition (well on our way)…and maybe we won’t. Perhaps we will build enough power among a united faculty to create more secure and better working conditions for the weakest faculty, and maybe we won’t. But I know this: The boss knows that divided, faculty are weaker, and embracing that division doesn’t change that fact. Also, it is better to try to accomplish what we know VCC did some years ago, than to throw in the towel before a real effort to build PT faculty power within a democratic organization has truly been attempted. Not saying it’s not hard work organizing and often frustrating work or that some local unions might have more propitious conditions than others. At Pierce College, we are perhaps currently luckier than at Olympic just now…. As far as Yeshiva, the NLRB said it was perfectly appropriate for all private sector faculty to be in the same unit. The NLRB was overruled by a Reagan-era Supreme Court that has not been particularly friendly towards labor-friendly law. As we know from the Citizens United ruling, the LEAST democratic part of our system of government does not shy away from tilting the power schema toward corporations and away from unions every chance it gets. Calling ALL private sector FT faculty as management is nothing more than another chisel tap, and citing it as a legitimate decision is unfortunate. Perhaps this is just the other side of the polemic, but there is value in having both on the table so that folks have the spectrum. I certainly learn a lot from Keith and Jack’s perspectives and I am sure I will have much more to learn, but I also hope that we will demonstrate by our contract campaign at Pierce College that a united faculty is not only possible, but gets the goods we all want and deserve as faculty. 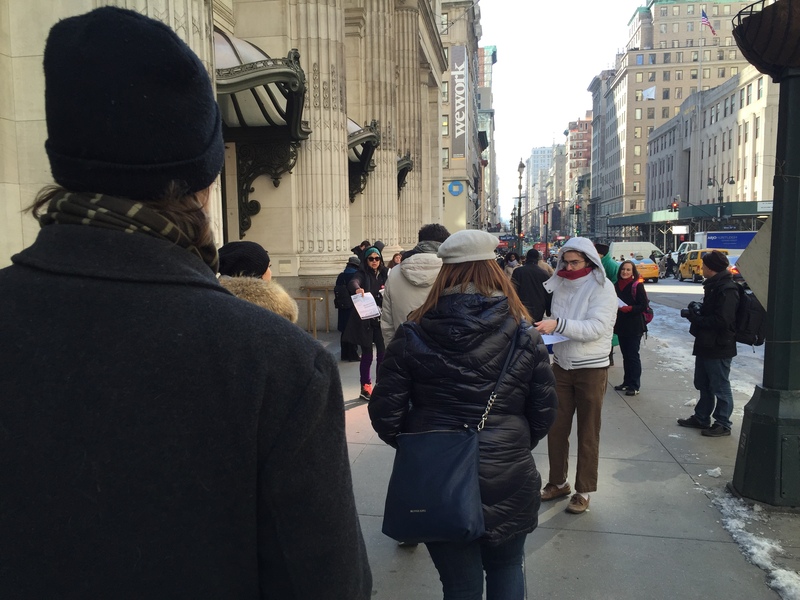 Day 10–No Response from CUNY Union Pres. Today we posted an additional statement of support for the letter campaign, from Borough of Manhattan Community College assistant professor and Graduate Center alum Arto Artinian, who notes the “profound break” in democracy at the union. I am now sending the letter again to the aforementioned recipients, plus Chen (as I now have her email address), along with the names and affiliations of the 173 signers. Read and sign the letter here, or leave a comment here with your name and affiliation (if you have one). There are now 173 of us, from across CUNY and the U.S., inside and outside of higher ed.